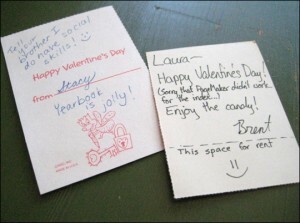 Inside are literally hundreds of cards and letters. 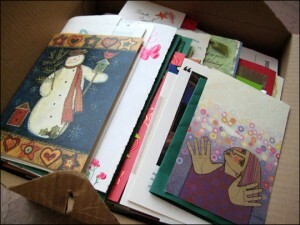 Just about every card or letter or postcard I’ve received in my life. I consciously kept them all – partly to prove that I had existed, partly to be able to go back and look at them later, partly because I’m a student of history and secretly hoped that one day historians would pore over my letters (primary sources, in history-speak). The box of cards and letters was quite large and I decided that I didn’t really want to continue to blindly keep ALL of them. So, I sat down this afternoon to pick through them and keep the ones that mean the most to me. Some of what I found made me laugh, hysterically, and some of it had me in tears. All of it tells of beautiful and close relationships – and of how much I have grown. A few years ago, my parents and my brother and I all happened to be in my home town at the same time, with a few hours to kill. There also happened to be boxes and boxes of old stuff in my mom’s garage that needed cleaning out. So, we all pitched in and went through the boxes, laughing at what we found and talking openly about memories that came up as we sorted through old books and school papers and childhood toys. My brother and I had kept a LOT of stuff, just sticking it in boxes for some later point in time. On that day, I got rid of almost everything I had kept. But, I also had the amazing opportunity to cherish each item amongst the only other people who would understand its importance. I think that we keep a lot of what we do because it reminds us of a particular memory. We may not really be attached to the object, but we feel the need to hold onto it because of that memory. On that day, with my family, I was able to experience all of those memories attached to all of those things – and create a new, even more precious memory that’s not at all connected to a thing. Today, going through these letters reminded me of so many various moments in my life – and I am thankful for this experience. In the end, I decided to release the cards with simple messages and keep the letters (after all, my history is contained within these letters). I’m a new reader so I’m just going through your archives and I had to comment on this post! 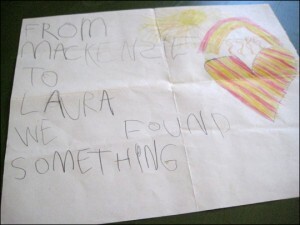 This was a very big problem for me because I found it so hard to let go of old birthday cards and letters. 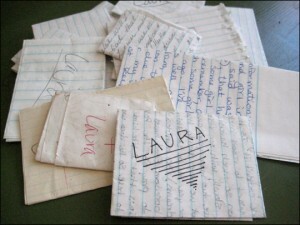 The time and effort it took for a loved one to write to me was not something I wanted to throw away. But then I had to ask myself, what will I do with all of these things once I am old? Will I just endure keeping them now only to let my kids throw them away for me? Shouldn’t I be the one to let them go? Thanks to technology, a part of the letters can be saved. I scanned/took pictures and recycled of a lot of them. And I have to say, it felt quite liberating to get the burden of those boxes off my back. I can still read them when I want to, just not the real tangible versions, it’s up to each person if they feel it’s worth that trade-off. Of course, I completely understand if you want to keep them, I would have too if I had them for long enough. Ah. 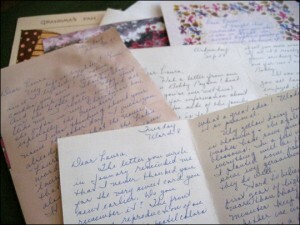 The art of letter writing. That’s something I need to rediscover myself!